Aliphatic nucleophilic substitution is a mouthful, but each piece tells you something important about this kind of reaction. 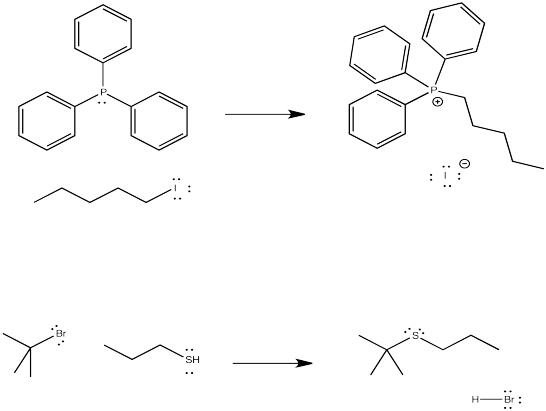 In substitution reactions, one piece of a molecule is replaced by another. For example, ligands can be replaced in transition metal complexes. Oxygen atoms in organic carbonyl compounds can be replaced by nitrogen atoms or sulfur atoms, in a particular variation of carbonyl addition reactions. These reactions all involve the addition of a nucleophile to an electrophilic atom or ion. They are all nucleophilic substitution reactions. Aliphatic systems involve chains of saturated hydrocarbons, in which carbons are attached to each other only through single bonds. Aliphatic nucleophilic substitution is the substitution of a nucleophile at a tetrahedral or sp3 carbon. Aliphatic nucleophilic substitutions do not play a glamourous, central role in the world of chemistry. They don't happen in every important process, the way carbonyl additions and carboxyloid substitutions appear to in biochemistry. Instead, they are ubiquitous little reactions that play important, small roles in all kinds of places. For example, polyethylene gloycol (PEG) is a commonly used polymer in lots of biomedical applications. PEG frequently has hydroxyl groups at each end of the polymer. Capping the ends of the polymer through reaction with another group can lead to very different physical properties. For another example, many biochemical processes require prenylation of proteins. That would involve a nucleophilic substitution in which a sulfur in a cysteine residue adds to a tetrahedral carbon in a prenyl group, replacing a phosphate group. In order to be an electrophile, that tetrahedral carbon should have at least some partial positive charge on it. In the simplest cases, this electrophilic carbon is attached to a halogen: chlorine, bromine or iodine. These compounds are called alkyl halides (or alkyl chlorides, alkyl bromides and alkyl iodides). Draw structures of the following alkyl halides. Lots of things can be nucleophiles in these reactions. Sometimes, the nucleophile is a neutral compound with a lone pair, such as ammonia or water (or, by extension, an amine or an alcohol). Sometimes, addition of a mild base is helpful in reactions of neutral nucleophiles. Show, with mechanistic arrows, how sodium carbonate (K2CO3) would play a role in the reaction. The third row analogs of these nucleophiles, in which the nucleophlic atom is a phosphorus or a sulfur, are also good nucleophiles in these reactions. Sometimes, the nucleophile is an anion. Cyanide anion is a good nucleophile, as are the structurally similar acetylides. Enols, enolates and enamines are also very good nucleophiles in this type of reaction. Semi-anionic nucleophiles such as Grignard (or organomagnesium) reagents and alkyl lithium reagents can sometimes act as nucleophiles in this reactions, but they are not very reliable. Complications often lead to other reactions instead. Gilman (or organocopper) reagents, in which a carbon atom is attached to a copper atom, can usually react with alkyl halides. However, they probably act via a different mechanism from the ones described in this chapter. Put a box around the nucleophilic portion of the following molecules. Note: lone pairs have not been drawn in.